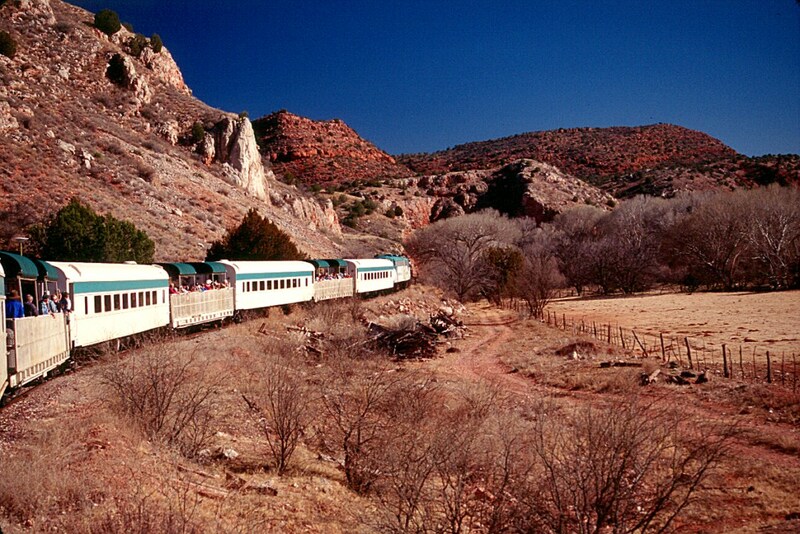 Train buffs, as well as visitors just looking for a good time, will enjoy a trip on the Verde Canyon Train. 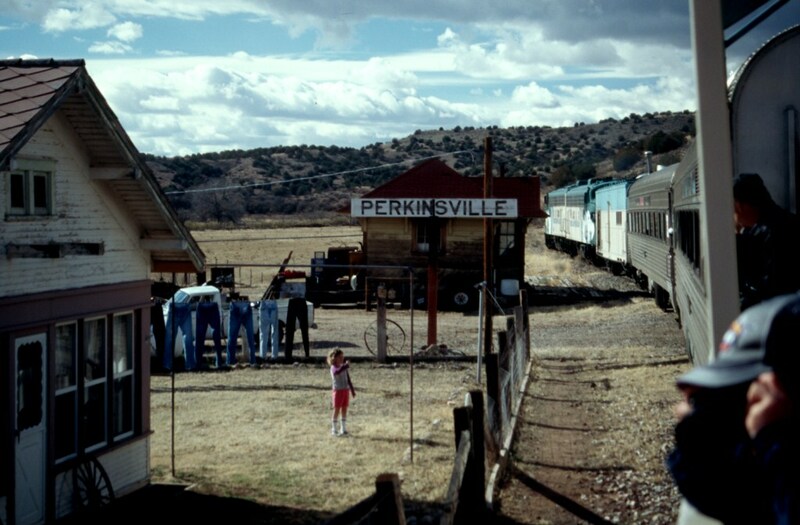 Located in the hills of Arizona, south of the Grand Canyon, the train takes a leisurely 32 kilometre trip from Clarksdale to Perkinsville and back. Clarkdale arose in 1911as the smelter town for the United Verde Copper Company that got its ore from the mines at nearby Jerome on the slopes of Mingus Mountain. 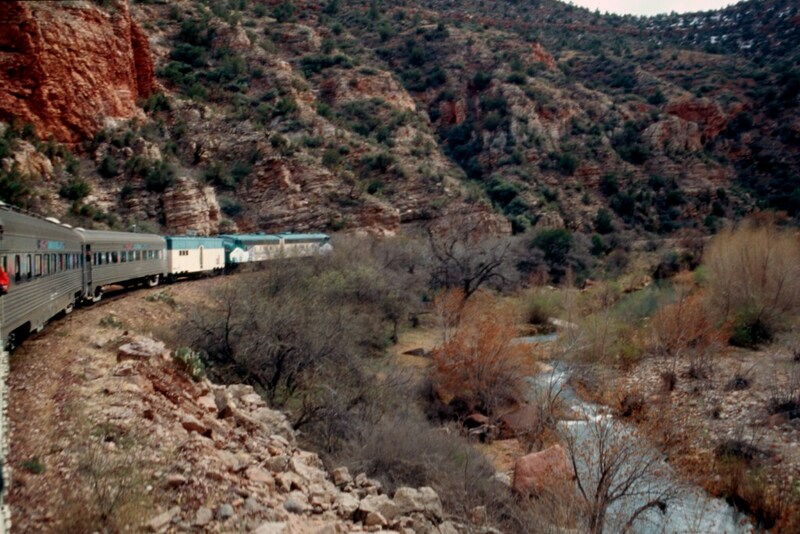 To take the ore to markets investors built a railway from Clarkdale through the narrow canyon of the Verde River. As usually happens, the mine eventually closed, and also the smelter. 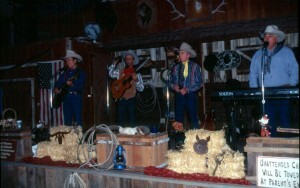 Clarkdale began to die. 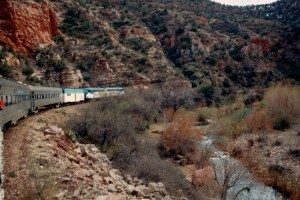 Now Clarkdale is kept alive by the Verde Canyon Train. 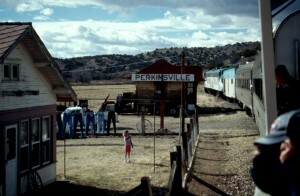 The scenic train trip draws visitors from all over the world. And it’s no wonder. Although it’s a short trip, only a 64 kilometre round trip it’s packed with beauty. Once you leave the scars of the slag piles at the edge of town, it’s a pleasant rural ride. 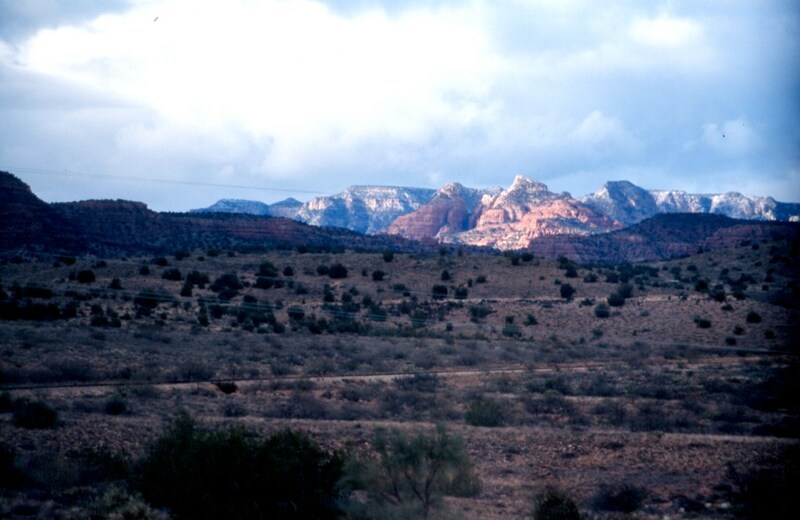 The greenish Verde River flows across the open valley floor to rush into the narrow confines of the canyon. Depending upon the angle of the sun, the walls of the canyon blaze in reds, pinks and golds. Along the river the green cottonwoods and other shrubs are resplendent with their backdrop of colourful cliffs. 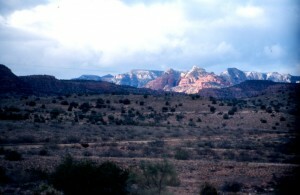 The canyon is a well established area for seeing wildlife, especially birds. In the arid country around the canyon, wetlands are enjoyed by birds and animals alike. The winter months of December to March are prime bald and golden eagle months. The train crew is quick to point out the locations of these big birds roosting in the trees or higher up on the cliff sides. The railroad was built with great difficulty, requiring a 207 metre tunnel to cut into the cliff where the river allowed no room for the track. Many side streams required culverts or short trestles. It’s the proximity to the river that really adds to the enjoyment of the trip. Dashing in places, and tranquil in others, the river is the source of water for the plants that grow along it, and for the many birds that flock to the brush and trees for hiding places and for their nests. Deer and antelope come down from the hills for a drink. They are not much frightened by the train and are often seen by the passengers. It’s probably best if you sit on the right side of the train as you leave the station. This will give you views across the river to the cliffs beyond, and some very spectacular views of the Sedona red rocks to the east. It’s also easier to spot the bald eagles. jeep you can visit Perkinsville by taking a rough road out of Jerome. 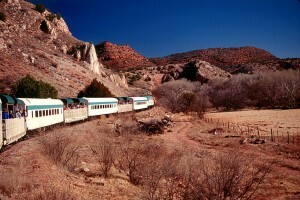 The train is the best way to see the inner part of the Verde Canyon. There are several different types of train trips and you might enjoy the Grape Train Escape on an evening trip into the canyon. It is unfortunate that this tour never uses steam locomotives. It’s a perfect location for the wail of the steam engine, and the chuff chuff of a hard working locomotive as it climbs along the river. Apart from that, this is a great trip, as attested to by the thousands of passengers a year that enjoy a relaxing 4 hours doing nothing but looking and savouring nature in the wild. After a terrific day why not stop at Cottonwood and visit the Blazin’n M Chuckwagon Ranch for a scrumptious supper followed by the best live Western music in town. Along the beautiful shores of Lake St. Jean in the Province of Quebec there is a townsite hidden among the trees and hilly terrain. Development began at the beginning of the1900’s with the construction of a pulp/paper industry. The location of the mill is at the base of Ouiatchouan Falls which drops 72 metres down the cliff with a fall higher than Niagara Falls. As the project unfolded a company town grew on the site. It was a town that would make nearby towns and villages envious because these well built homes had running water and electricity in the early 1920’s. Suddenly, it all came to an end in 1924 with the layoff of most of the workers. People moved away and the properties lay vacant for many years. Fortunately, there was a dream to preserve the old town, and that dream became a reality. 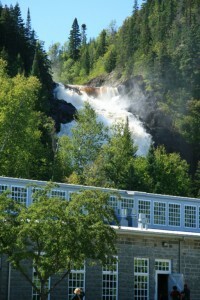 In 2009 money from the Quebec Provincial government led to the formation of a $19.7 million dollar project to refurbish the town to attract tourists to the area. Thanks to the new 182 site campground the visit to the historic village can be combined with a camping trip in a pleasantly wooded area. The best way to get started is to join the guided trolleybus tour. As the bus makes its rounds you will learn about the workers, and their lives in the town, and see some of the more impressive buildings. The townsite location is slightly hilly and you may appreciate the availability of a ride which is there if you need it. 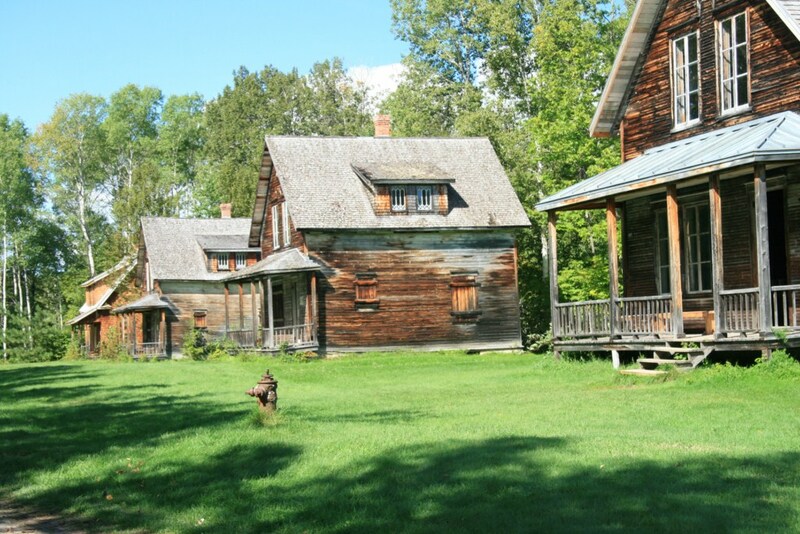 We preferred to start off walking by ourselves along the trail from the visitor centre to the historic buildings. It was early September and leaves were starting to turn, adding an extra element of beauty to the walk. After reaching a staircase of 115 steps we came out onto a flat area with several rows of identical houses. These were surprisingly picturesque and in very good shape. 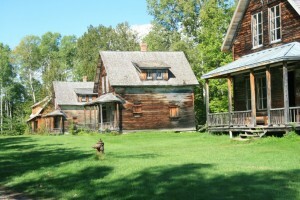 Actors in period costume occupied some of these homes to re-enact life in the early century. The furniture in some of buildings resembled homes of our parents. The cream separator, used to separate the cream from the cow’s milk, certainly didn’t look out of place in the kitchen, and the old wood stove looked as if it would provide comfortable heat on raw days in the fall and winter. The walk continued past a few homes that will not be repaired, but left as they are to show what would eventually have happened to the entire settlement if it were not for the forward looking people who led the charge to preserve it. A steep descent in the trail led us to an open area near the mill where we could see the magnificent plumes of water cascading over the falls. Staff workers have excavated part of the mill to reveal the old equipment. There are also facilities for a bit of lunch before exploring the waterfall and river. You have a choice of riding to the top of the cliff in a closed cable car or poke along slowly climbing the 764 steps. We rode up, and walked down them. 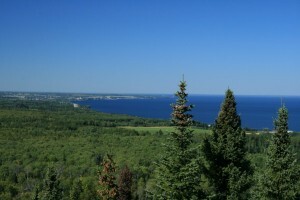 The views out across Lake St. Jean are great and you can also see farmers working their fields at the base of the cliff. Once you reach the top, or what you think is the top, you are met by a long board walk that takes you to an upper falls, Maligne Falls. Along the way you pass a small wooded cabin of the type trappers and woodsmen might build for their temporary stay in the woods. Small, it was easy to build, probably easy to heat and tough enough to withstand bear attacks and also of that smaller, devilish creature, the wolverine. 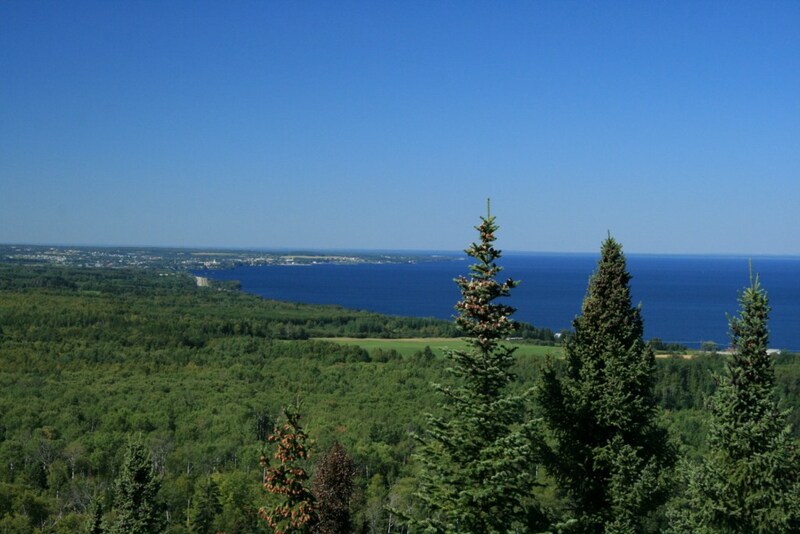 On the way back down, take advantage of viewing areas of the falls, and also out over the lake below. This is a great way to spend a relaxing day, and get lots of fresh air, and exercise at the same time. 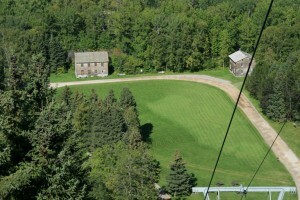 Those responsible for the restoration of the town have also created entertainment in the form of theatrical shows, group gatherings and an old fashioned photographer’s studio where you can record your family’s visit to this great Historic Val-Jalbert.